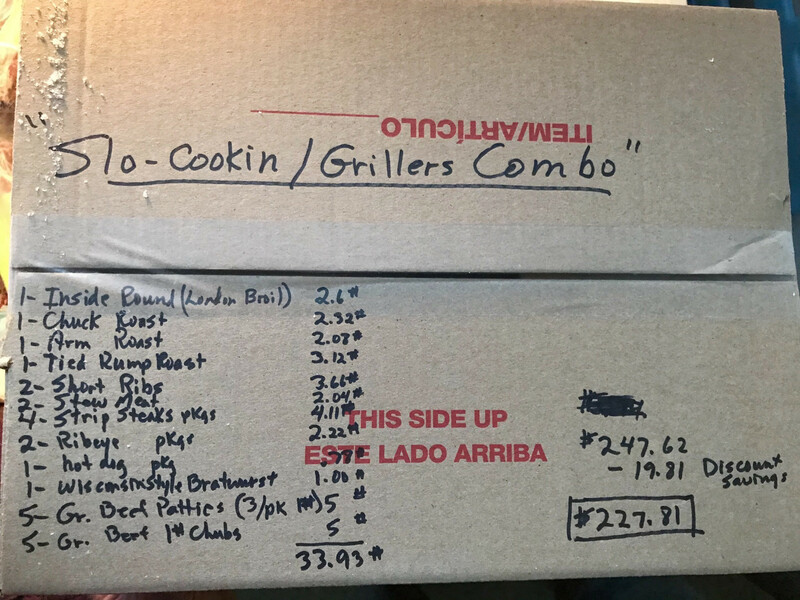 Box contains 1 Tied Rump Roast, 1 Chuck Roast, 1 Arm Roast, 1 Inside Round Roast (London Broil), 2 Short Ribs, 2 Stew Meat, 4 pkgs Strip Steaks (2/pk), 2 pkgs. Rib eye Steaks 2/pk), 1 pkg. All Beef Hotdogs, 1 pkg. Wisconsin Style Beef Bratwursts. 5 pkgs Ground Beef patties (one lb. 3/pk), 5 one lb. Ground Beef Chubs. Weights of individual pkgs are weighed and tabulated, so each box will vary. A discount of 8% is then deducted from the regular price.